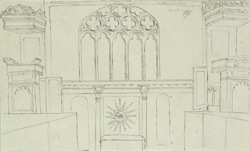 An outline view in ink of the interior of the east end of the church of St Mary-le-Bow at Durham. The church was built of local stone and opened for service in 1685, replacing the legendary White Church, or Tabernacle of Boughs, in which St Cuthbert's body was supposed to have rested before the completion of Durham Cathedral. The west tower was erected in 1702 thanks to the charity of parishioners.